Do Security Systems Really Deter Crime? The answer is in the numbers. Statistics show how much a security system can impact in deterring crime in homes and entire neighborhoods. 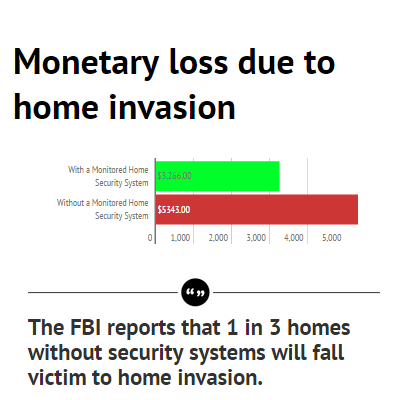 According to the Electric Security Association, the average loss of a home invasion is $5,343.00, but that average drops roughly 39% to $3,266.00 for homes that have a monitored security system. The FBI reports that 1 in 3 homes without a security system will fall victim to a burglary as compared to 1 in 250 homes that do have a security system. Additionally, a study was conducted by Cromwell-Olson-Avary that demonstrated that nearly all convicted burglars (90 %) admitted that they would avoid homes that are equipped with security systems as well as concluding that 75% would reconsider entering a home that had a yard sign or window decal. The Alarm Industry Research and Educational Foundation (AIREF) conducted a study in 2013 that found that 60% of convicted burglars stated that they would avoid a target home if they were aware an alarm system was present. The Electric Security Association stated “even during impulsive, unplanned burglaries, more than 50% of the intruders said they would discontinue the burglary if they discovered an alarm. Another 31% said they would consider discontinuing the burglary.” The ESA estimates that 74% of uncompleted intrusions can be credited to an audible alarm. The likelihood of a home invasion to occur decreases by the number of monitored security systems in a neighborhood.